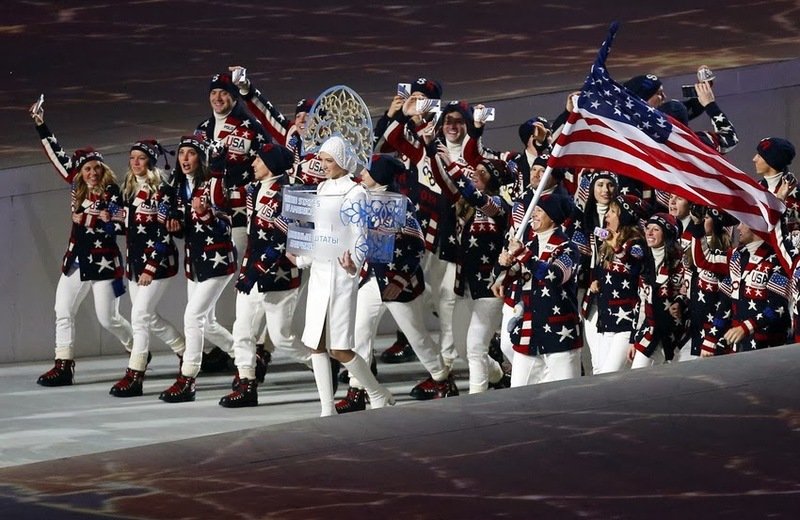 Call it what you will, coincidental, happenstance, divine intervention, but I think it is fate that brought together New York Fashion Week & the Olympics Opening Ceremonies to overlap in the same week. The fashions in both events are innovative, new, fresh, and sometimes (most of the time) quite odd. But every once in a while, some clothing item comes along and you think, "I could TOTALLY wear that straight off the runway!" Or in this case, the flight from Sochi. Oh yes, yes yes yes. 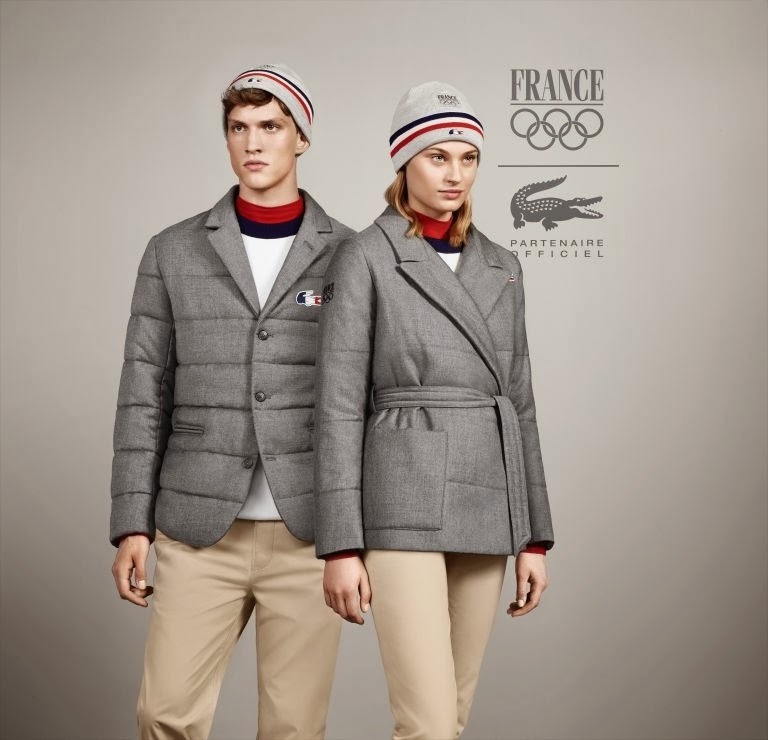 Lacoste did it right. Sophisticated, classy, warm, and flattering. Pretty sure I need this since I basically live in the American version of Russia right now. At least temperature wise. Our water is clear where I am. Ok Georgia's outfit is just alright, but the headdress LOOK AT THAT HEADDRESS can we talk about that headdress of the model lady carrying the sign? I predict this hitting stores nation-wide next winter. 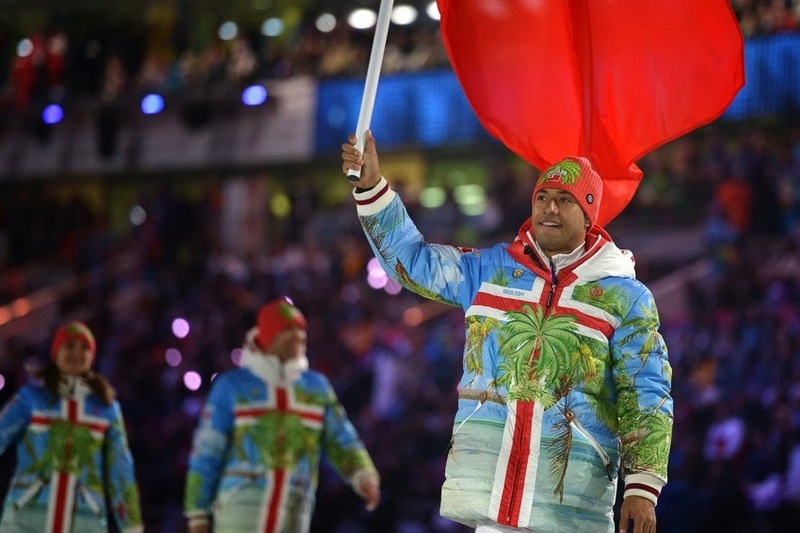 Hats off to Poland for their use of ombre in their jackets. Very "right now" & hip. 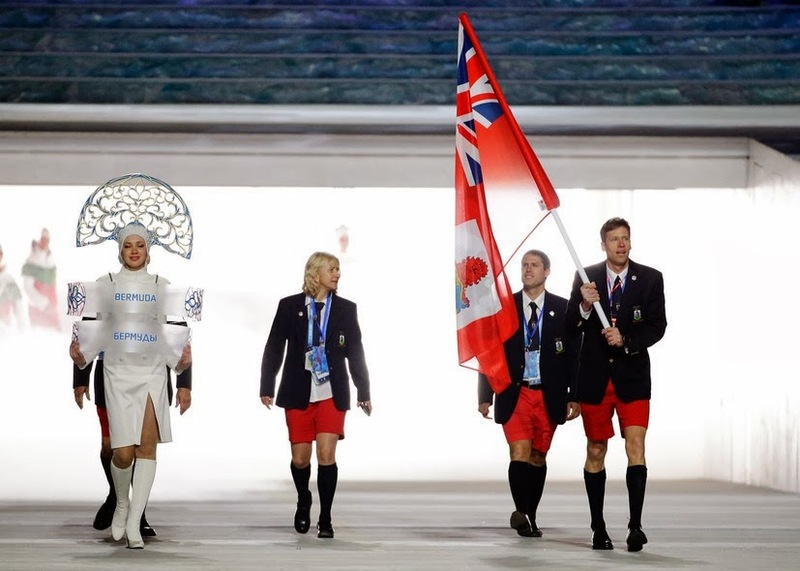 Loving these toggle jackets, well done, Canada. I have a newfound respect for the Cayman Islands because of these outfits. Not many people can pull off heavy jackets, Bermuda (ironic?) shorts, and flippy-floppies. High-five to the man on the left showin' off his tats. Which came first, the shorts or the tats? Something to ponder. I would totally wear those jackets and the hats the athletes from the Netherlands wore. Love the pom-pom on top. Also guy/maybe girl right of center apparently didn't get the memo to change her shoelaces to orange. They can't all be winners. Ah the Swedes, they know what's up. These are my people/ancestors. Well done on the cobalt jacket (super chic) and the printed leggings. 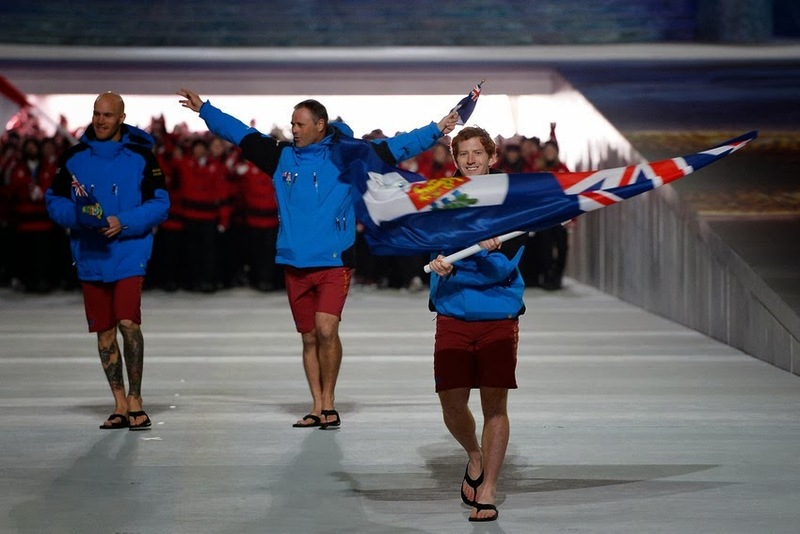 Hey the Bermudians are actually wearing the official shorts of their country! This is great. Love the blazers and ties. The knee-high socks are a nice touch as well. Fur-lined coats are always a classic. And the girls all look beautiful. Wondering where all the Russian men are...maybe locked in their bathrooms? Tonga. Genius or hideous? The jury is still out on that one. I'm kinda digging it though. I love Ralph Lauren. I really do. And I think these slightly questionable cardigans are just over-the-top enough to be considered awesome in my book. Borderline hipster, but still awesome. I want one. I would wear it so much. 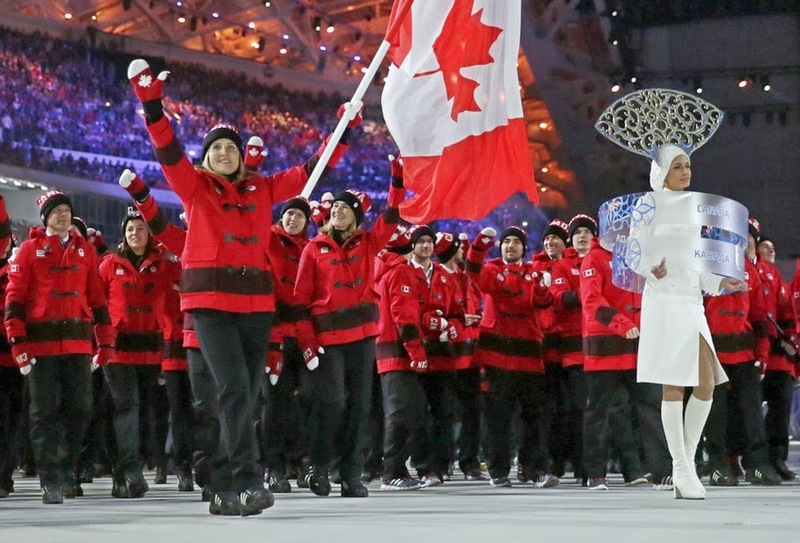 What were your favorites from the Opening Ceremonies? Coming up later this week, NYFW faves. Excited for: Valentine's Date(s) this weekend! Should be: Walking to lunch. But it's too cold. 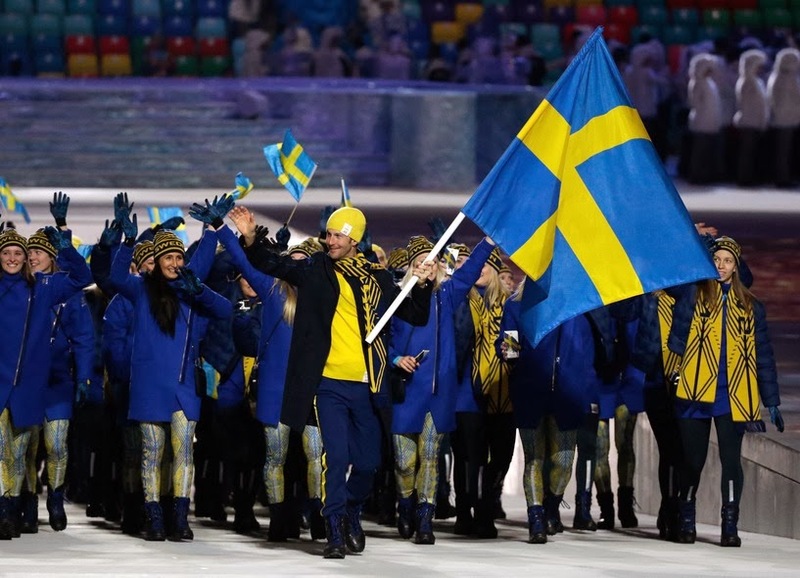 I like your assessment of the Swedish outfits. A little edgy, but with a great touch of class to them. My favorite part was their scarfs, the design is rad! 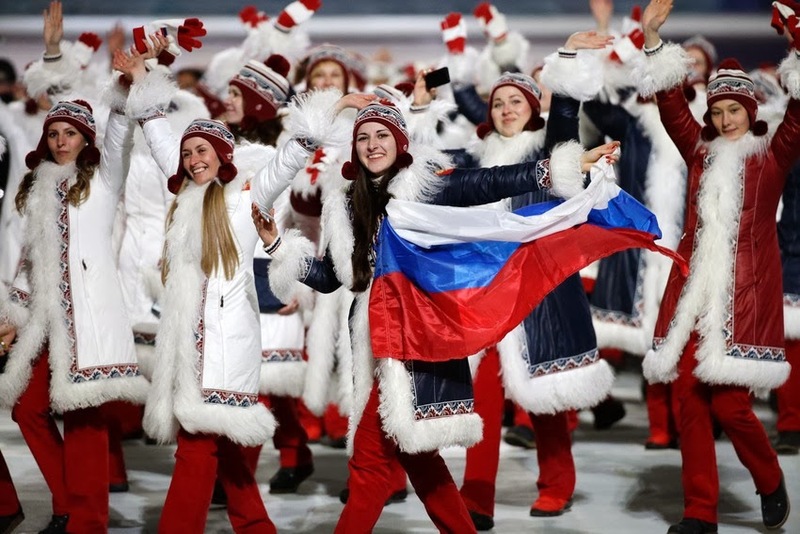 I also thought the Russian outfits were great despite that people said they look like Santa Claus outfits. My response was always, "What's wrong with that? Who doesn't love Santa Claus?!" I hadn't heard the comparison to Santa Claus, but I can see it now. You're right though, who wouldn't want to look like him? Especially if you're in Russia. P.S. Brownie points awarded, indeed.